Fayette, Michigan was once one of Upper Michigan’s most productive iron-smelting operations. It is located on the Big Bay de Noc of Lake Michigan on the southern part of the Upper Peninsula. 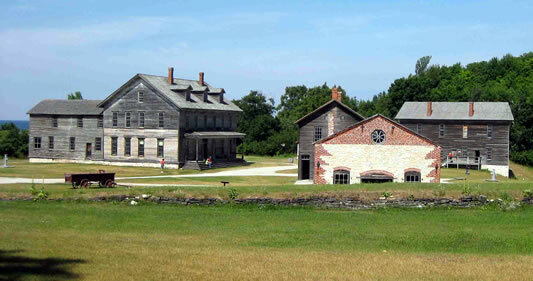 Fayette Historic State Park was established to show what life was like in the town during the 19th century. Over 20 buildings are open, with restoration continuing on other parts of the town. On the second Saturday of August the annual Heritage Day is held in Historic Fayette Townsite. The event celebrates when Fayette was still a bustling iron-smelting town. Activities for the day include period displays, food, and music. Also within the Historic State Park is Snail Shell Harbor. This harbor offers overnight or day use boating opportunities. Also allowed within Snail Shell Harbor is scuba diving. A fee and use permit is required for this activity so all divers may participate. However please do not remove any artifacts or any other item found while diving. There are approximately 5 miles of hiking/cross country ski trails within the park. 9 a.m. – 5 p.m. mid-May through mid-June and Labor Day through mid-October. 9 a.m. – 7 p.m. mid-June through Labor Day. A Michigan Recreation Passport is required to enter Fayette Historic State Park.